The Futbolgrad Network brings you our Bundesliga team of the week for matchday 21 as voted by Chris Williams, Manuel Veth and Jack Grimse on the Futbolgrad Network Gegenpressing Podcast. SV Werder Bremen’s Jiří Pavlenka was the consensus choice of the Futbolgrad Network panel for the goalkeeper of matchday 21. The 26-year-old was the foundation of Werder Bremen’s 4-0 victory over FC Augsburg. Not a spectacular keeper Pavlenka simply got the job done stopping all three of Augsburg’s shots but also acting as a calming influence to his back four. There was plenty of debate when it came to the three defenders. The panel eventually opted for a three-man backline that included Martin Hinteregger (Eintracht Frankfurt), Niklas Stark (Hertha Berlin) and Jérôme Roussillon (Wolfsburg). Hinteregger joined Eintracht Frankfurt during the January transfer window after he was suspended by his former club Augsburg for criticising FCA head coach Manuel Baum. At Eintracht Frankfurt, Hinteregger did an excellent job replacing the injured David Abraham and without a doubt enjoys the prospect of European football. Hinteregger is joined by Stark, his side beat Gladbach, and Roussillon, who was already a candidate last week. Attacking midfielders dominated the proceedings on matchday 21. In fact, three of the midfielders that made the list could also feature as forwards in a 4-3-3 formation. Those three are Kai Havertz, Julian Brandt (both Leverkusen) and Jadon Sancho (Borussia Dortmund). In fact, even James Rodríguez (Bayern) has shown his ability to play as a false-number nine but is mostly at home as a typical number 10. James, in particular, is starting to look like his former self. The playmaker was excellent in Bayern’s 3-1 victory over Schalke. Dominating in midfield the Colombian has been part of several transfer rumours throughout January, yet it remains likely that the playmaker will ultimately remain with his club Bayern. Once again plenty of candidates could have made the attacking line. Robert Lewandowski (Bayern) was one player, for example, that was ultimately left out — as was Borussia Dortmund’s Mario Götze. 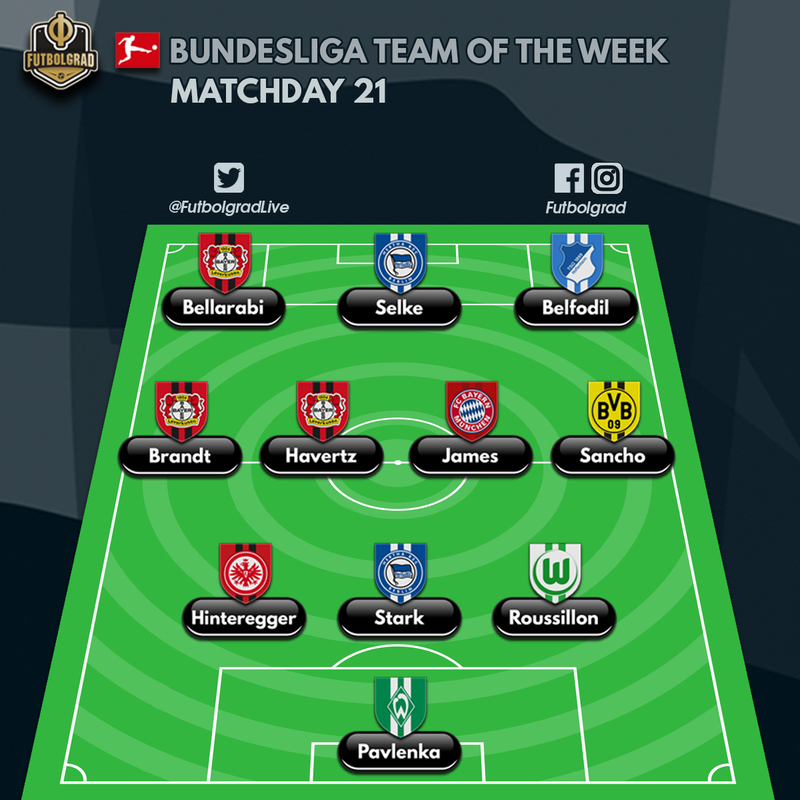 There was, however, no argument over Karim Bellarabi’s inclusion the Bayer Leverkusen forward was fantastic against Mainz and easily made the Bundesliga matchday 21 team of the week. Bellarabi is joined by Davie Selke (Hertha) and Ishak Belfodil (Hoffenheim), whose two goals were fundamental in Hoffenheim’s fantastic comeback against Dortmund. For more listen to the latest Gegenpressing Podcast!